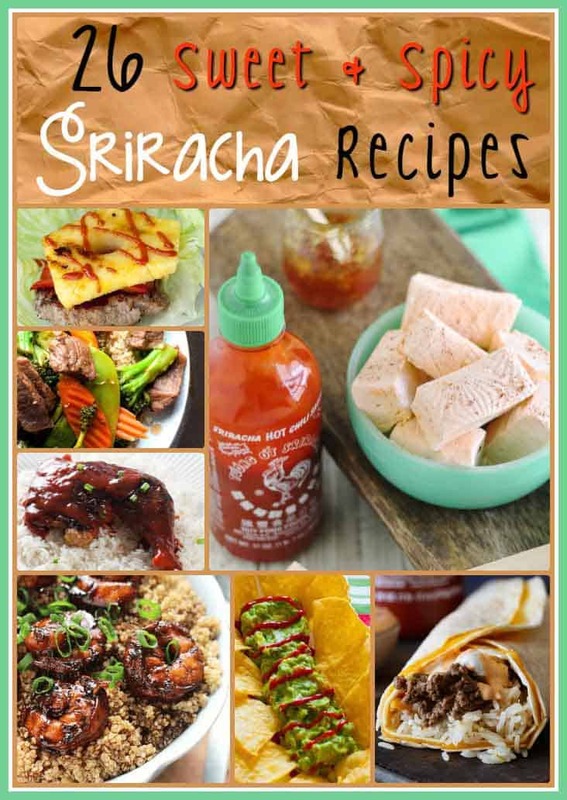 Sriracha, the chili sauce from Thailand, is a hot sauce you have certainly discovered before. I know some people call it Rooster Sauce, for the big Rooster that is on the bottle. Either way, this sauce is made with chilis, garlic, vinegar, and more. It is named after the coastal city of Si Racha, in Chonburi Province of Eastern Thailand, where it may have been first produced for dishes served at local seafood restaurants. Is the favorite of so many people. I know I always keep a bottle of it on hand. Here are 26 Ways to enjoy this Sweet and Wonderfully Spicy Sauce. We all love this wonderful sauce. It is more than just a condiment. It is a sauce that you can use in so many ways. Here are many creative ways to use this sauce. You can use this sauce in main dishes with meats such as beef, chicken, or shrimp. You can even enjoy this sauce in your dessert. Julie’s Eats and Treats – Zesty Sriracha Shrimp Quinoa – This recipe is great for those who are looking to really pack in the protein. CopyKat – Sriracha Guacamole – Just the right amount of heat is added to this Guacamole. The Complete Savorist – Sriracha Brownies – Did I mention you can put sauce into brownies? Try this sweet and savory chocolate dessert. Real Food by Dad – Sriracha Sloppy Joes with Roasted Jalapenos – Sloppy Joes aren’t just for kids anymore. Enjoy the sophistication of this dish. CopyKat – Sriracha Honey Glazed Leg Quarters – Oven glazed leg quarters are so easy to make. Recipe Girl – Slow Cooker Sriracha Cranberry Baby Back Ribs – whip out that slow cooker and make some baby back ribs everyone will love. This Mama Cooks – Sriracha Roasted Red Pepper Deviled Eggs – perfect to bring to a party, I promise that tray will come back empty. Lexi’s Clean Kitchen – Sriracha Lime Chicken Chopped Salad – looking for a recipes that is clean, this chicken salad is exactly what you want. Julie’s Eats and Treats – Tofu Stir Fry with Honey Sriracha Sriracha Asian Sauce – have some vegetarians in your life? Be sure to check out this Tofu dish. Shared Appetite – Sriracha Quesarito – This is a recreation of a Taco Bell favorite. Make yours at home with this easy recipe. Sprinkle Bakes – Sriracha Lollipops – Yes, you can turn this into candy. Peas and crayons – Bacon Sriracha Potato Salad – Potato salad is twice as good when you make it with bacon and Sriracha. Kaylyn’s Kitchen – Sriracha Grilled Cheese – You can make a delicious sandwich with one secret ingredient. The Bewitchin Kitchen – Maple Sriracha Stir Fry – Sweet and spice make a stir fry special. Jman and Millerbug – Honey Lime Sriracha Shrimp Pasta – Are you looking for a new spicy pasta dish? Mom Foodie – Creamy Sriracha Dip – Are you looking for a new dip for your next gathering? Wonky Wonderful – Sriracha Glazed Almonds – Set out a bowl of these and watch them disappear. Just Us Four Blog – Sriracha Chex Mix – Do you love Chex mix? Try out this variation. Sweet Little Kitchen – Sriracha Hummus – Sweet and heat make for a delightful vegetarian treat. Joyful Healthy Eats – Sriracha Mac and Cheese – Everyone loves Mac and Cheese, take it up a notch with a little spice. From Valerie’s Kitchen – Sriracha Refrigerator Pickles – soon you can enjoy spicy and crunchy pickles. Midget Momma – Easy Sriracha Dipping Sauce – try a new sauce with grilled meats and chicken nuggets. 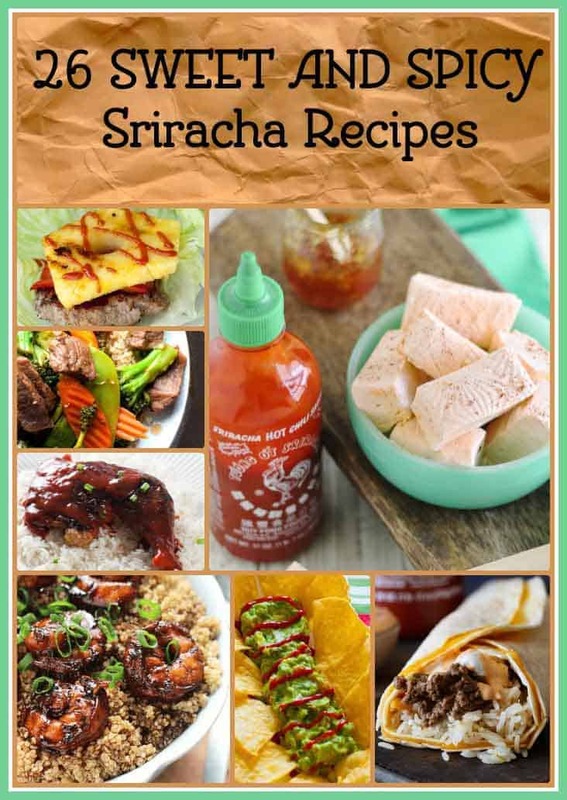 Mama Likes to Cook – Sriracha Salt – make this, and you will have an amazing salt to serve with so many dishes. Farm Fresh Feasts – Sory Sriracha Roasted Mushrooms – These roasted mushrooms have just the right amount of spice. Lemon Tree Dwelling – Skinny Sriracha Egg Salad – Try this light egg salad with a kick! The Bewitchin Kitchen – Pineapple Sriracha Turkey Burgers – Looking for a new way to serve up Turkey Burgers? Around My Family Table – Sriracha Popcorn – You haven’t had popcorn until you have had Sriracha popcorn. Sprinkle Bakes – Sriracha-Orange Marmalade Marshmallows – Yes, you heard right on this one. Marshmallows are so good when they are homemade. Food Lion – 30 Minute Sriracha Teriyaki Meatballs – your family is going to love these meatballs! 365 Days of Crockpot – Sriracha Turkey Lettuce Wraps – Love the PF Changs Lettuce Wraps? You will love these. The Pioneer Woman – Spicy Cauliflower Stir Fry – Cauliflower is the highlight of this stir fry dish. Baker by Nature – 20 Minute Spicy Sriracha Ramen Noodle Soup – Have dinner in a flash! Good to know where the name came from, it is unique. I’d love to try it! I am such a wimp when it comes to spicy food. I see a few here that my guy would love, though. My husband and oldest love hot sauce. These recipes would be perfect for them to try. Sriracha is not my favorite spice but when I tried it on potato chips I loved it! So I guess I will open myself up to all the recipes. I love this flavor, it has grown on me over the years. It really isn’t that hot.